The good news is that enough people have read my poem “A Gobbling Miracle Happened There”* that it has been featured on a popular blog. The bad news is that the blog is called The Worst Things for Sale. This makes my Internet emoticon mouth go slashwards. Despitewise, for me, the final pur [lot] is cast in favor of The Worst Things for Sale because the blogger is clever enough to use an Amazon affiliate link code, meaning they will get a few kopeks commission on sales of all the commercial junk that annoys them. This self-irony is laudable. I also have an affiliate link code. May they earn enough off my poem for a cranberry martini with sufganiyot on Nov. 28, and may I be wealthy enough to join them. 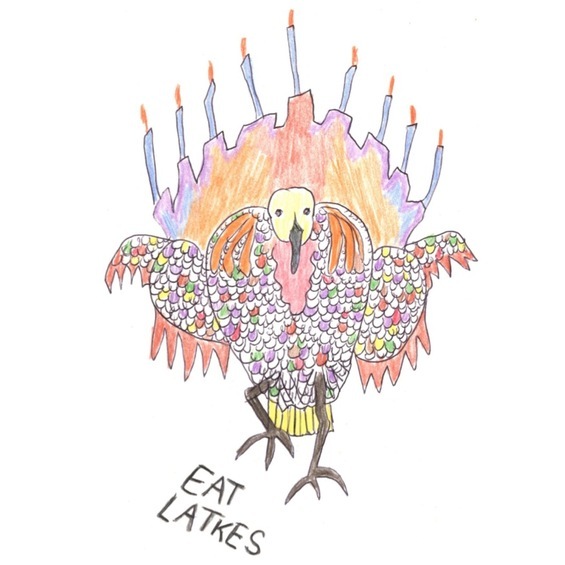 To this end, I would also recommend to holiday revelers Mark Binder’s charming story “A Very Schlemiel Thanks g’ Hanukkah (Thanksganukah)”, another story unique to Thanksgivukkah — the debate over the holiday’s name might not be settled within the next week — featuring immigrants who try their hand at deep-frying a turkey. Thanksgivukkah cannot be crushed. Thanksgivukkah wins by infinity because, while the blog of “the Internet’s most horrible items” bills itself as a daily communiqué, the holiday of Thanksgivukkah is once-in-a-lifetime. The holiday is rarer than Halley’s Comet, plus it tastes like turkey and latkes. Even vegetarians are piqued. It cannot be maligned. Shine a blacklight on it, and it glows. As far as I am concerned, the double holiday of Thanksgivukkah is a reason to be double happy — commercialization or no. In the darkness, light your candles! Glow! You can help with the miracle told in this rhyme. Greet all thy neighbors, make peace in thy time. * n.b. : Although Amazon requires your 99 kopeks for the poem, you won’t need a Kindle device to read it. Free apps will accommodate Kindle-formatted reading material on your computer or smartphone. 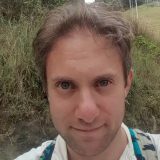 Boston resident Tucker Lieberman has published essays in Zeek, Jewish Mosaic, Shalom Magazine, and the Mayyim Hayyim blog, and his poetry has appeared in Ariga. He studied at Brown University and Boston University. His poem "A Gobbling Miracle Happened There" made the top of Amazon's "Hot New Releases in Judaism" list in the week leading up to Thanksgivukkah 2013. His poetry book "Wild Mushrooms" is available from Lulu.com.